This promotional booklet was issued by the Maitland Chamber of Commerce in January of 1925 and published by Rollins Press, located in Winter Park, Florida. 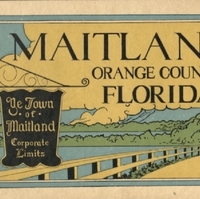 The booklet promotes the town of Maitland for prospective settlers and visitors, and focuses on aspects of the town, such as lake front homes, schools, the leisurely lifestyle, proximity to Winter Park and Orlando, social life, and the expansion of industry and infrastructure. This particular copy likely belonged to J. H. Hill of 134 Magnolia Road in Maitland, Florida. Original 16-page booklet: Maitland Chamber of Commerce. Maitland, Orange County, Florida. Winter Park, Florida: Rollins Press, 1925: Newspaper Collection, accession number 2014.002.020V, room 2, case 2, shelf 10, box GV, Maitland Historical Museum, Art & History Museums - Maitland, Maitland, Florida. Digital reproduction of original 16-page booklet: Maitland Chamber of Commerce. Maitland, Orange County, Florida. Winter Park, Florida: Rollins Press, 1925. Originally created by the Maitland Chamber of Commerce and published by Rollins Press. Copyright to this resource is held by the Maitland Chamber of Commerce and is provided here by RICHES of Central Florida for educational purposes only. Maitland Chamber of Commerce. “Maitland, Orange County, Florida Promotional Booklet.” RICHES of Central Florida accessed April 22, 2019, https://richesmi.cah.ucf.edu/omeka/items/show/6480.